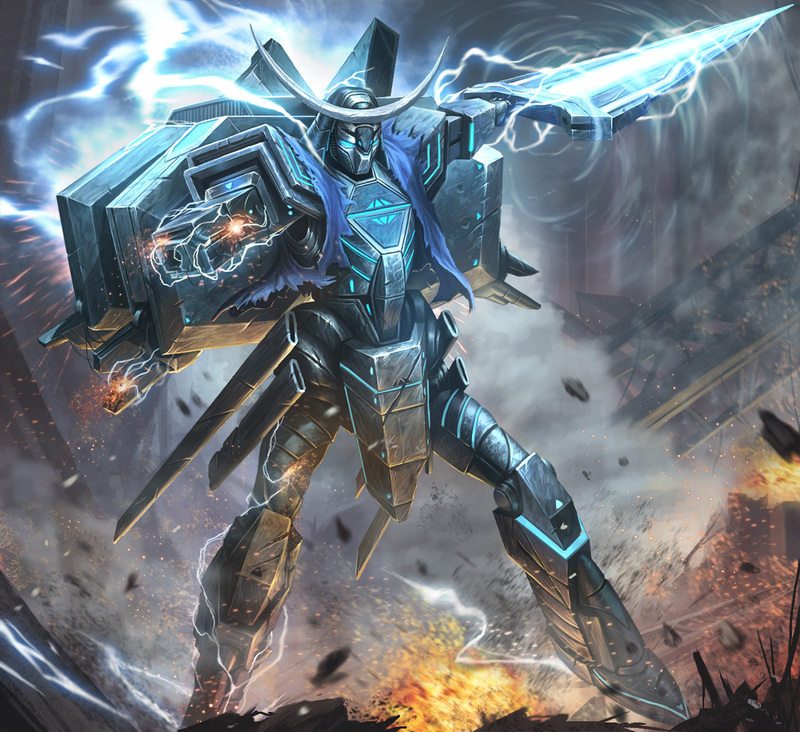 Delve into the various orders of Starship Samurai! Koyanagi cursed as the towering metal warrior turned in his direction. He pulled hard to the left, veering his craft away before three of Masamune’s swords could connect with him. Two of his squadmates were not so lucky, the shining energy blades passing through their fighters as if they were overripe pears. But dodging the swords threw Koyanagi into the brunt of the space battle. A smattering of energy bolts crackled past his cockpit, at least one errant shot scoring his carapace. “Where’s our mecha?” someone screamed over the communicator, while Koyanagi pulled up, and out of the worst of the cannon fire. An alarm on his console told him the hit he took had punched a hole in his engine. He had maybe five minutes before he was locked in a terminal drift, so he located his carrier, and sped toward it. “Many regrets,” responded another voice on the communicator. “The mecha was rerouted to a planet of higher priority. There are no further resources.” Up ahead of him, Koyanagi watched his carrier disintegrate under the weight of combined fire. Panic momentarily seized his heart, but he lifted his chin and closed his eyes. He calmed his breathing. Death was unavoidable, but it would not find him weeping like a child. Welcome back to the Lotus Galaxy! Today we have another preview for Starship Samurai, this time focusing on the unique and innovative order token system. Be sure to check out last week’s preview covering how location’s work and the powerful Samurai Stomp! Now, let’s take a closer look at how order tokens can shape your strategy and lead you to victory! Each turn, players will need to choose one of the four orders available on their player board. To perform an action, a player will choose one of their remaining order tokens and place it in the order space of whichever order they wish to perform. Each of the four orders available have an “X” value in their description. This “X” value will be treated as whatever the value of the chosen token is, allowing for players to tailor their action to the needs of a turn. Let’s take a closer look at each of the 4 orders in detail. Move Allegiance: Using this order, players can move different clan markers on the Allegiance Board up or down “X” spaces, either removing them from enemy branches or bringing them to their own branch. We’ll cover the Allegiance Board in detail later on, but just know for now that the more clans you sway to your branch, the greater your claim to the throne becomes! Move Units: As we covered in last week’s article, this order is key in strengthening your position at various locations in a round. Units can be moved from your unit supply or from other locations, as needed. Draw Cards: One facet of the game we haven’t explored yet is the powerful Action Card deck that players can draw from. 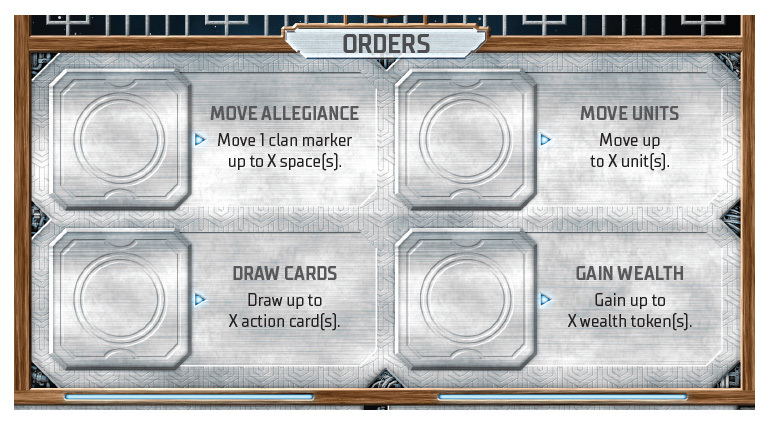 Various order and battle cards can be found there to aid your machinations or give the upper hand in battle. Gain Wealth: This order gives the player wealth tokens equal to the value of the order token used. 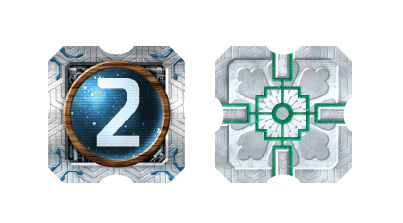 In addition to being used to pay for certain action cards, wealth tokens also have a very unique ability when applied to placing order tokens. We’ve already seen how orders react to the value of the order token chosen, but wealth tokens allow players to manipulate that value. When placing an order token, a player may also spend any number of weath tokens to increase the number value on that order token by the number of wealth tokens spent. As players accumulate wealth through the game, they will be able to spend that wealth to strengthen the power of their orders. That’s all for this week’s preview! Join us next week as we explore the Alliance Board, battle cards and more! Also, be sure to check out last week’s preview on locations and the Samurai Stomp! Remember, preorders for Starship Samurai are available now, and each preorder from our web store and participating retailers will include a full set of acrylic clan and player score tokens! You can preorder from our webstore here. Isaac Vega is lead game designer and art director at Plaid Hat Games.